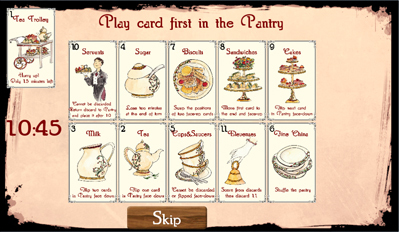 Elevenses for One is a digital adaptation of a card game that was nominated for the 2014 Golden Geek Best Print & Play Board Game award by Boardgamegeek.com. The original game was designed by David Harding II with artwork by TJ Lubrano. The digital version of the game was brought to Android by Maxim Matyushenko; who has ported other print and play games to the platform in the past, including a great version of Zombie in my pocket (ZIMP). Mr. Matyushenko's experience shows as the quality of the app and its user interface are clean and professional. TJ Lubrano's great artwork shines in the digital version. Mr. Matyushenko is to be commended for digging into the print and play board gaming scene and finding titles with solid game mechanics that translate well into casual play apps, bringing games to a wider audience that might otherwise have been missed by all but a niche crowd. I look forward to seeing more from this author in the future. Elevenses for One is essentially a solitaire hand management / set collecting game where the player attempts to get the necessary cards together in sequence before running out of time (moves). I've been playing the game a bit on my phone, and it really is a great diversion for those times when you have a few minutes to burn. It is a quick casual puzzle game with an element of luck, and well worth the price in my opinion. The game is priced at a mere $1.00 and can be purchased on GooglePlay, so there is little risk in checking out whether or not this game is for you. "You are Grosvenor, the maid to Lady Agatha Smythe, one of the wealthiest landowners in the district. She is holding a gala High Tea at 11 o’clock – but, oh dear! You only have 15 minutes to get ready and where is that sugar? You mustn’t be late! The madam’s reputation is at stake! 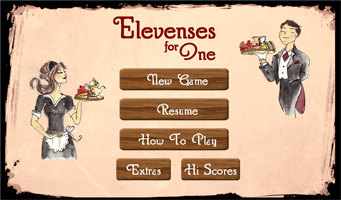 Welcome to Elevenses for One – a game for one player who must load her Tea Trolley with all the accouterments required for a splendid morning tea... before the clock strikes 11! 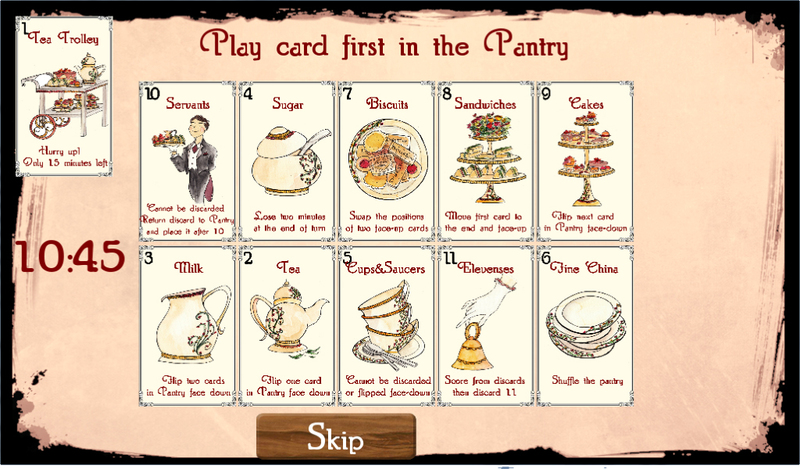 A micro solitaire game with just 11 cards (each with specific actions the player must choose to follow or ignore - possibly to her detriment), Elevenses for One is a tense puzzle. Can you load the Tea Trolley correctly within fifteen actions?"